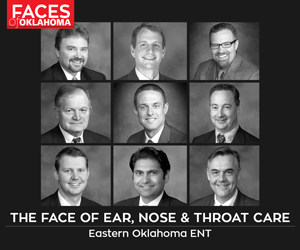 Oklahoma Alliance of Fans founders (from left) John Wooley, David Smith and Bart Bush. Photo courtesy John Wooley. Oklahoma Alliance of Fans founders (from left) John Wooley, David Smith and Bart Bush. The curtain of time wasn’t the only thing that parted on that summer day in 1964. A big stack of comics I’d bought off the stands during the preceding few years parted from me as well. I was so crazy to get Wham Comics No. 1 that I traded Paul just about all my prime Marvel superhero comics, including first issues of The Fantastic Four, The Amazing Spider-Man and The Incredible Hulk. I figured something from that long ago had to be worth a whole raft of comics I’d bought for a dime and 12 cents in the recent past. Well, we now know how wrong I was. If I’d held onto those Marvels, I might be writing this column from a villa on the French Riviera. Although Paul didn’t hang onto them either – and I take some small solace in that fact – the comics I traded him are now worth umpteen hundreds of thousands of dollars. 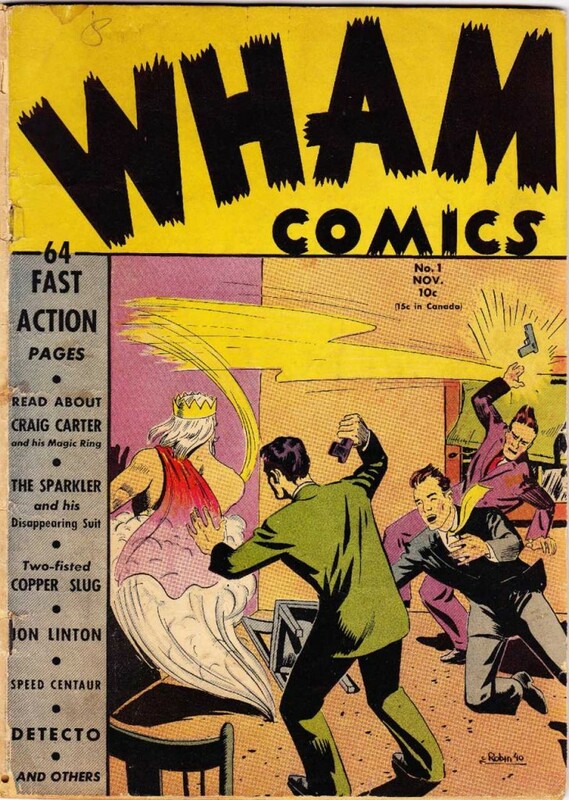 Meanwhile, the last time I looked, a pretty nice copy of Wham Comics No. 1 had sold online for $300. The purpose of this anecdote, however, is not to moan or mourn; it’s to help emphasize something that’s come home to me. As a lover of nostalgia – that siren call of an idealized time from your past – I now realize that if you live long enough, nostalgia for a period of time before your birth slowly metamorphoses into nostalgia for yourself. 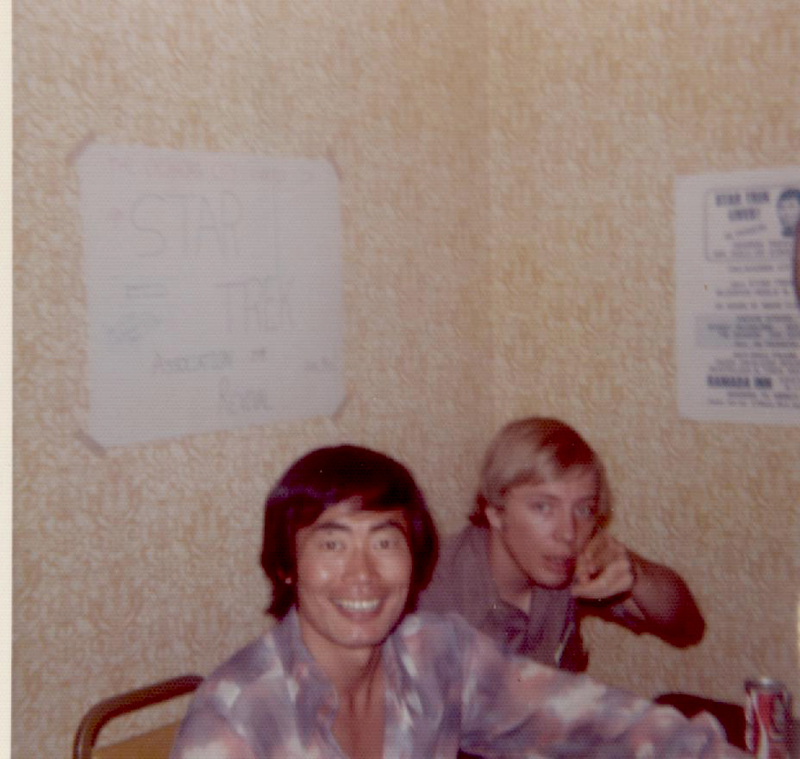 George Takei of Star Trek and social media fame visits with John Wooley in 1975. Photo courtesy John Wooley. I don’t know how old I was when I first realized that I had a deep, mysterious love for a past in which I had not been a participant. I do remember that in high school and college I was a sucker for old movies, radio shows, 1940s comic books and the big bands of such long-ago names as Glenn Miller, Tommy & Jimmy Dorsey and my personal favorite, Hal McIntyre. There was a bit of a fad for nostalgia during this time, even though the notion of a young adult collecting old comic books or vintage movie memorabilia was unusual enough to warrant newspaper coverage. 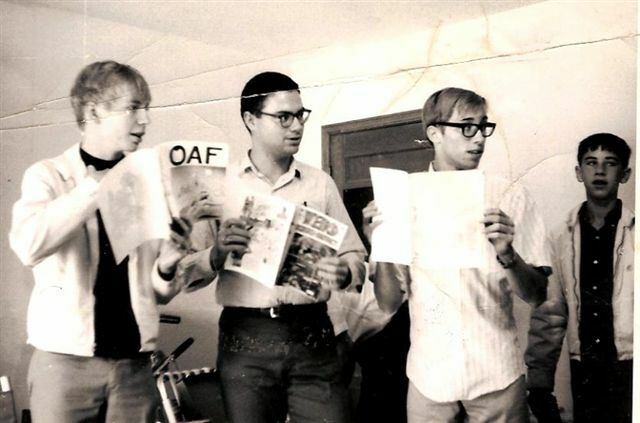 It happened to many of my friends, and also to me, in the late ‘60s, when I was attending Oklahoma State University, and several of us banded together in a nostalgia lover’s club known as the Oklahoma Alliance of Fans, better known as OAF. After all these decades, we OAFs still get together once a year, buying, selling, swapping and visiting – just as we’ve always done. But thanks to the relentless shoving of time, the stuff we’ve got to sell, trade or just show off now is just as likely to be from our lifetimes as not. 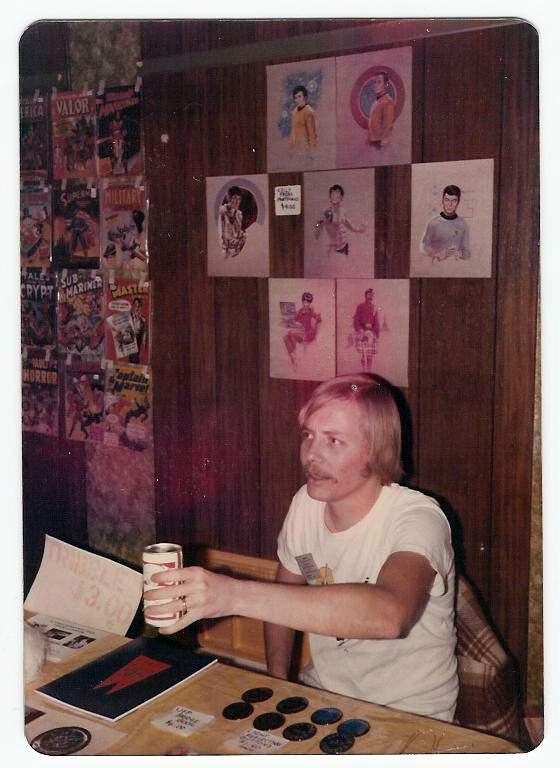 When I traded Paul for Wham Comics No. 1, its date of publication was 24 years in the past, an era so different from my own that the book could’ve been drawn and colored by cavemen. Now, I think about what was happening 24 years ago in my life, and it seems like last week. john Wooley in the early days of the oklahoma alliance of fans. I can remember when this whole idea of nostalgia for oneself first hit me, less than a decade after my acquisition of Wham Comics No. 1. I was in the Navy, stationed on a helicopter carrier that had just left Vietnam for Hawaii, where we were to pick up Skylab II. My friend and former roommate Bruce Shults – a fellow OAF – happened to be stationed at Pearl Harbor, and we had a great reunion. At some point, we decided to go to a local theater and take in the new film American Graffiti. Of course, it was terrific. But as I sat there and watched it unfold, something began to bother me. It took a while to figure it out, but I finally realized that this movie about, essentially, the final loosening of high school bonds, was set in the same time frame as my own – and my growing-up years had suddenly become quaint. It was still nostalgia, but it was tempered for the first time with an almost shocking sense of loss. The writer John O’Hara famously said that nostalgia was a kind of homesickness. Certainly, that describes nostalgia for yourself. Like homesickness, it’s an idealized vision of a place you loved, or think you did. What I try to remember now is that, like everyone who makes it through adolescence, I had my own problems and struggles during the teen and young-adult years, and one big reason nostalgia was so damned important to me was that I deeply craved it as an escape from some of the pressures of daily life. Everyone can use a little escapism, of course, but maybe your passion for it is directly proportional to your need for it. These days, I’ve come to terms with this changed face of nostalgia. I still love old movies – those made before my time as well as the first-run films from my youth – and, as I’ve written in the pages before, I’m delighted to see so many of them, along with television shows I remember fondly, offered again by free, over-the-air HD channels like MeTV and getTV. They play like TV movies did when I was a kid, interrupted by commercials every 15 minutes or so, and I’ve even gotten used to those ads, which reflect, sadly enough, their aim toward the demographic that now includes me. (One ubiquitous spot begins with the announcement, “People who use urinary catheters are smiling!”) It’s taken me a little longer to accept the fact that the only oldies radio station in town now plays Guns N’ Roses when I’m expecting Lesley Gore. Peter De Vries, a novelist and writer for The New Yorker, is credited with the wry observation that nostalgia isn’t what it used to be – meaning, I think, that longing for the past in the past was better than longing for the past now, and nothing is as good as it once was. On the other hand, despite the long-ago hosing he gave me, Paul McSpadden and I have enjoyed a very good friendship for half a century, and without our shared love for nostalgia, we never would have met. The two of us still go to old bookstores together. We even occasionally make a trade. But believe me, if he ever turns up another copy of Wham Comics No. 1, I’m running the other way.